Good morning, dear Blog readers! Well, in my part of the world it's morning! I know, I know, it's been quite sometime, that I blogged and every time, I have a huge gap in writing, my blog always start with the above line, it's funny! I like to be honest by saying, no specific reason behind not blogging! I just did not do it! Though, I missed writing, rather, typing a blog! Another funny thing, I noticed myself, that every time I am silent for a long time, I do write the same line, 'I missed writing'! But it's true, I do miss! Writing, is something, I love! I am not too great, when it comes to express myself, verbally or vocally, but I know, myself for a fact, I can write, express, communicate awesome by writing! Well, I am saying this confidently because, each important people in my life, has/had admired, appreciated, recognized, loved/loves still to read my messages/emails/notes/hand written letters/ and of course you, my dear readers, encouraged and supported reading my blogs! I can say, I have/had a quite an interesting, important people who really really encouraged, admired my writing and looking forward and missed when I did not write! It goes back long long time ago, when I was a small girl, I used to leave small notes to my mom, on the kitchen counter(on the sugar or coffee powder box, which was always on the countertop), it would be, even as small and simple note as "Amma, kobrimitai(an Indian dessert)was awesome, or Amma, you are looking so beautiful in that yellow saree.."!! From there, I used started writing letters to my uncle and aunt(my mom's brother and sister), who went to work and got married and went to Delhi and Bombay, respectively! I used to write long letters to my uncle, who was my role model, well, 'was', is always, but he passed away an year ago....! I used to write all the details about the family...my mom's side a big family, with 7 sisters and 4 brothers. And I used to write to him, about my visit to my grand parent's house and what every one was up to....! I use to add my little observation about the visit, in a funny way, which he used to say, after a long day's of work and stuck in traffic, when I come home today, was nothing to eat and had to cook, but there was this letter waiting for me, which made me smile and laugh and did not know, when I finished cooking and ate! My aunt, used to always say 'your writing is like your mom, you should take up writing, seriously'! And later on, when my grandfather went to live with one of my uncle's in Mysore, I used to write to him, often.....and I must say, he was my biggest fan, ever!! After I got married and came far away....started to write to my mom, my brother, my father-in-law, my sister-in-law, my aunt.......! (Oh, actually, my communication with my husband started with letters and emails!! Since I could not get visa immediately, I could not join him, so my communication with my husband was letters and emails!) Life started to get busy, with new things, but one thing never stopped was writing! After two kids were born, I became busy, and I did not know to drive at that time, so I could not go out on my own, had to wait for my husband for everything. So was always home, with small kids, and the only way to have 'my' time was to write! That's when my husband, suggested to write a blog!! At that point, in his life, he had so much of 'experience' about my writing, I must say!! I might be sitting next to him, but I would have sent a message or a email..and emails were always pretty long.....! lol! So he suggested, I should start blogging! That's when I started "Ultimate Vegetarian"!! And today after 9 years, I still do write.....emails, messages, blogs....but no more handwritten letters!! Its so unfortunate and so sad and depressing that, to those I used to write the hand written letters, my mom, my uncle, my grandfather, my father-in-law, are no more........! And to those I still write, all those hand written now has been replaced, with emails, whatsapp messages, facebook messengers.........! Well, well that's my journey about my writing and one thing, lived with me constant, throughout my life, I can say is, writing! Today thought of sharing with you all, my journey of writing. Thanks from bottom of my heart for reading, silently following my blog, encouraging, and most of all, I could do so, is only because, of you, dear Readers! I could do this, only because you read, and respond and appreciate and give me feedback! Thank you! Okay, let's eat! Today, I will be sharing 'Tomato Gojju', Gojju, can be described as tangy, sweet-sour dish and it's totally South Indian, especially, Karnataka style. It can be prepared with wide varieties of vegetables and pineapple too. Okay, if you are too new to the word, Gojju, now you can relate something to pineapple taste, which can be sweet and sour, that's exactly Gojju, taste. I always say, it's an acquired taste! I am sure, many people don't appreciate or like the taste of pineapple, so it's either, you love Gojju like crazy or you dislike!! (lol), no medium path...like...i might like or not...! Tomato Gojju, is yet one another, my mom's, the best, my most favorite, very tasty Gojju, which can be done super fast. Since I wrote about myself today, I thought of sharing one of my favorite recipe, of my mom's today. Wash and cut tomatoes into small pieces. Add oil to the pan and when the oil is warm, add mustard seeds and when it splutters, add hing, curry leaves, tomatoes, rasam powder, salt, sugar, and on a medium heat, keep mixing it occasionally. If required, add a very little water, as tomatoes itself are jucier. 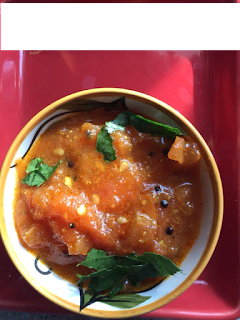 Allow to boil, until all the tomatoes are nicely cooked, mushy, and add coriander leaves to garnish and serve this yummy, hot Tomato Gojju, with chapathis, rice, or Dose or idlis(acquired taste!). It can be saved for more than a week, if made for 5-6 tomatoes, in the fridge and can be eaten cold too, with some warm chapathis or yogurt/curd rice. Enjoy! Hope all my blog readers are doing good, enjoying summer, well, as I always mention, in my part of the world, it's summer. Summer becomes like a special occasion, every year, as its only very few months where you can get as much as you can Vitamin D! lol, well that's how my perspective of summer is! Anyways, parenting is hard, complicated, I know that, I understand it, and I am experiencing it! I have written about parenting many times...and today also I would like to share a incident, which again, will give raise to many questions. My kids go to Reading and Math program from past 5-6 years. Even in summers we don't take a break. In winter months, I always, sit in my van, waiting for my kids to finish their work, either listening to music, reading a book, or playing game on my ipad....! I usually don't go and sit inside, where there is a waiting area, for parents to sit, as it is always crowded, and it's generally moms who comes and waits there......would be talking out loud.....and you get to hear different languages, some I can understand and many I don't! So to avoid all those, I used to sit in my van. Now it's summer, I thought many would be on vacation and may not be crowded inside and also I don't like AC (air conditioner), so past few times, I am going inside the center and waiting there, when my kids finish their work. As I expected, it's not crowded and also, I see dad's waiting, who would be generally working on computers. So as I was sitting with my ipad playing a game.......a mom came in, with two kids, both of them went inside to do their work and mom sat with her phone, she had her ear phones on, so I guessed she was talking to someone. But as she did not talk, I thought she must be listening to music!! I just continue playing on my ipad......with few mins, her daughter came out, saying she is done. The girl was pretty loud, so everybody had to turn their head or lift up their head. The mom was even louder, asking her, how come she finished so fast, she has to go inside and complete her work. But the girl did not answer, but climbed a chair and was stood. There is a big glass window, where you can see kids working inside. The girl started to call loudly....I guess she was calling her brother(?). There were two dad's working on their computer, 2 moms, one was reading a book and the other was just sitting, folded her hands and watching, and then it was me with the ipad. We were all looking at the girl and the mom, expecting she would say something. But the mom, seemed not disturbed or bothered. The girl started jumping from one chair to another, and once she fell, as she slipped, we all sort of reacted as "oh", but still the mom, remained as though it has nothing to do with her!! The girl seemed to be very restless and not able to sit in one place, she now, started drinking water, from the water cooler, and more than drinking, she started to dip her fingers and sprinkle on everyone..standing in front of them and sprinkle to their face. Seeing this, the Dad who was on computer, got up and went outside!! She did not stop,the girl was giggling, sounded fun for her, and the mom remained same cool, looking at her phone, probably, now I thought, she might be watching some serial or a movie....!? And when the girl sprinkled to her mom, then she shouted in a loud voice, to stop and sit on the chair! The girl just sat next to her, and started to ask, 'give me the phone to play'! The mom suddenly turned to her and said 'can't you not see I am working, and you sit properly on the chair, everybody can see your underpants'!!!!!!!!!!! Really, really she said that, loudly?? I felt embarrassed, as there were dads also there and I saw couple of them walked out! Girl must be about 5-6 years old, I felt, she was uncomfortable of what her mom said, she was looking at every body's face, and then sat properly, took her homework and started to go through it...! I really felt sad for the girl and felt how sensitive she should be at that young age to understand, atleast, something went wrong there!! I was upset with the mom, who really did not care about anything! If she was really 'working', is working so important than your own kids!? Why choices becomes hard, for women, when they have to choose between career and home!? That bothers quite a bit! Well, am nobody to judge anybody, but as a matter of my observation, I just shared with you. Having said that, I will leave at this point, for you to think......and move on......! Today is my mom's birthday, if she was there she would be 83 years beautiful mom! As a tribute to the most wonderful, amazing mom, thought of writing a blog, sharing the most yummiest recipes of her, Bisibelebhat! The popular, South Indian dish, which my mom, was making in a authentic, from scratch, which turned out to be the delicious meal. It's a complete one pot meal, which has rice, dhal, veggies, all spices, fills you up and what else you would need! 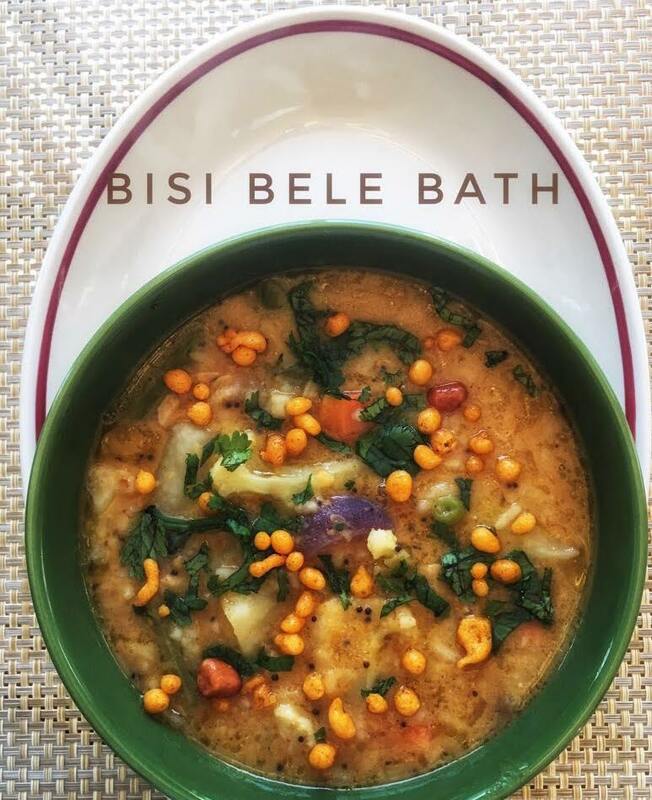 In most of the houses in South India, Bisibelebhat, even to this day, would be a Sunday special lunch or any time guest invited, Bisibelebhat would be the main part of the meal or on any festival day it would be a main thing! Bisibelebhat should be on a liquidy side when you are done, as it gets to become very hard later. Keep adjusting water through out cooking. Take a deep vessel or container, and add enough water and boil, once it starts boiling, add Thoor dal, and mix it and let the Thoor dal cook, half way, then add rice and all the veggies. You can add capsicum and onions little later, as they cook fast. Keep stirring in between, as Thoor dal tends to stick to the bottom. Once both rice and dal cooks well, almost mushy, add tamarind water, salt, very little jaggery and keep stirring and boil it for couple of mins and add Bisibelebhat powder. I would recommend to mix the powder in little water, make it to a paste and then add and keep stirring, adjust water as required. It's okay to be on a water consistency, later it becomes very hard and firm. Be careful at this point, as it splatters a lot and your hand might get burnt! Keep stirring and reduce the flame to medium-sim. And while doing that, in a small pan, add oil or ghee, and add mustard seeds, when it splutters, add cashews and fry golden brown and add that to the Bisibelebhat and turn it off!! Your Bisibelebhat is ready to eat, with some boondi or raitha or just as it is, with some ghee on top! Enjoy! It's been quite sometime, 4 months, that I shared my thoughts and recipes with you all! I missed blogging, it's very relaxing and it's my own time, which I always love to do, but sometimes life just goes on and on, though you want to sit down and write, you may not had that moment! But today, just started to write, as its raining heavily, cleaners have come to clean the house, after 2 months and I am forced to sit in one place, as they are cleaning around the house! So sat down with a cup of coffee. Public speaking! Does that comes to you easily, without blinking, without thinking, without any hesitations, inhibitions, nervousness, awkwardness? Then you are a born public speaker! No doubts about it! Recently I attended some 13-14 sessions of public speaking classes. Well, I did not plan to or register myself into one. It just so happened, that I attended those sessions. My kids got enrolled in that, and there was a parent, who volunteered, she could conduct classes, for parents, while they wait for their kids for 2 hours! So me and my friend, both decided to register to the class, as it was very cold in the morning, nothing else to do in those two hours, neither go back home, as it was bit far and come back nor anything else to do close by. And soon we both felt, it was worth spending some time there, since we both recognized that there was so much out there, to learn, though it was hard to wake up early on weekend, and bundle up as it was freezing temperatures! Slowly I understood, its a structured program! You start off with table topics, which is on spot, you are given a topic, and you need to talk about it. And then ice breaker speech, which would be about you, you can talk about yourself or any important memory or incident of your life! Its all timed, 3-4 mins, and there will be evaluators, who would evaluate, time, how many pauses or likes,ums,so's etc being used, your body language, where you used the whole stage or just stood folding your hands,were you nervous, voice modulation, eye contact.......! Am just briefing out....! Each and every week, you would be doing new speeches, improvising based on your previous evaluation! Well, that's what its expected or supposed to be! Now, I like to sit behind and evaluate the whole public speaking concept! Will it help!? Before going further on this, I will make one thing clear here is, kids at very young age, exposed to anything for that matter, grasp fast and will make a difference in what they learn, how they learn and they can really improve their skills! But as we grow old, there are certain basic things, which, no matter how hard you try, you "might improve", a bit, that's all! One of them is public speaking! If its not in you, sessions, classes, won't help you much, well, that's my argument or my experience or thinking! The things which won't comes natural, will land up us in misery, awkward, embarrassing situations! I am not commenting on the sessions I participated. It was really awesome experience and met some really nice people and get to know their experiences and values. And neither I am saying, I did not learn anything.....I did! I do know many things know.....but will I be able to put all those theory into practice, time will tell....!? But somewhere, somehow I felt, public speaking should come naturally to you. Improving your eye contact, body language, is all fine, you might improve on those, over a period of time. But still overcoming nervousness, hand trembling, voice shaking, face becoming red......those things, should come from within! I don't think or call public speaking as a skill, it's just you have to born with it, thats all! If you are introvert or shy or hesitant to speak up, or you might be humble to express.....so to those kind of people, no matter how much you get trained, it still will be awkward, feels like "fish without water"! Having said that, I leave this topic here, for you to think.....! Now I will share the most yummiest recipe of my mom, Vangibhat! Vangi means eggplant or brinjal, cooked with spices and vangibhat powder, and mixed with rice, a typical south Indian rice dish, very commonly made in every household! My mom used to make the most authentic, yummy Vangibhat! 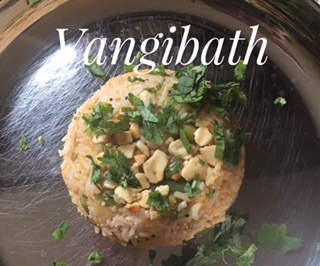 But now Vangibhat has now taken various twists and turns and you can add any kind of vegetables and Vangibhat powder mixed with rice, but still call it as Vangibhat! Because of its unique flavor of the powder, the mixed rice tastes very yummy. In my house, anytime, any day, my husband and kids love Vangibhat. It can be eaten with raitha too, but typically you won't, but my husband loves, raitha, pretty much with everything, so I make it and its also a nice way to make kids eat yogurt! Today I will share my mom's most yummy recipe of Vangibhat, made with onions, green bell peppers(capsicum) and averekai(Surati papdi lilva). You can add any combinations of vegetables, or just do with one, capsicum,potato,methi leaves,peas,onions,carrots and beans,cut into thin slices. I will share my Vangibhat powder recipe separately, under my Powders, label. Until then you can try with store bought Vangibhat powder! Pressure cook rice and keep aside, rice should not be mushy nor too split, it should be cooked just right. I use Sona masoori variety for making Vangibhat. In a deep pan, heat oil, and add mustard seeds and once it splatters, add curry leaves and onions, capsicum, and on a low heat keep frying, until aroma comes, now add averekai, mix well and add little salt and little vangibhat powder and mix well, make sure the vegetables get nicely coated with salt and vangibhat powder. Add rice, more required salt and Vangibhat powder and mix well. Add dry coconut or desiccated coconut and mix well. And turn off the heat. In a small pan, add ghee and cashews and fry golden brown, and add to vangibhat, add finely chopped coriander leaves and mix well. I add dry coconut sometimes, since my vangibhat powder has dry coconut powder, so its optional, some people add fresh coconut too, it's according to taste and preferences. Enjoy warm Vangibhat, with some happla-sandige or raitha or just plain vangibhat! Good morning dear readers, well wishers! Its morning in my part of the world...! So 2017 is coming to an end, actually 2 days left. Thought of connecting with you all...! Am sure you all would be looking forward for New year, new resolutions, new goals, and carrying forward, the dreams, which may not have come true in 2017, looking forward, working hard on it, to make it happen in 2018...! Year starts...year ends....we make resolutions, and today, please tell me, how many of you actually stick to resolutions made, how many of you actually, follow the resolutions which are made...please be honest! I can write about mine, honestly! I am very enthusiastic person, when it comes to festivals, people coming to our house for dinners and lunches, or something like this new year....I do get super excited, I start to clean up the house, cook, do Parayana (recitation, chanting) waking early in the morning....! Yes I will also make new year resolutions....and past few years, its been the same pattern, same resolutions....of eating healthy, exercising, may be start working....! But surprisingly, nobody asked me back, whats your resolution......! There was some distraction in the topic, so I did not get a chance to talk about my resolution! But if I got that chance, will I tell my resolution.....!? Well, this year, no resolutions is my resolution!! Okay as I wrote before, I will be honest, as I said, I am very enthusiastic when it comes to festivals, etc....but, later on, it slows down...I somehow can't stick or remember to my resolutions!! I analyze a lot everything, before getting on to a judgment or conclusions...so according to my analysis, we all get, lost in day to day business, too much focused on other stuffs, lot of distractions....especially I blame it to gadgets also, that we tend to loose interest on resolutions made..! And if the pattern of the same things, as hard as loosing weight, eating right, exercising, every year the same resolution, of course, we wont and we cannot do it! So thats the reason I decided not to make any resolutions this year...! And also yes, health, exercise is all important but, there are so many other aspects of life, which we can focus, which we can make it as a resolution, and may be we might be motivated to follow it and get excited in accomplishing it! Like, learning a new language, learning an instrument, or traveling, or doing organic gardening, making sure, you almost don't buy any veggies outside, but grow in your backyard(well, there goes indirect way of taking care of your health and eating healthy), or volunteering, anywhere, you like or desire, ! Or carry forward, any one of your parents legacy....may be spiritual, may be any talent they had, you can tap on it and see if you have, if you haven't done all these years! Or pick up some thing from our parents, and following it and carrying it forward, being a role model to your kids also....! I lost both my parents, in less than a year...am still on healing process...this pain, I guess, is life long! But trying to think and remember of just not happy moments spent with them, but I am spending my time, in being grateful, showing gratitude and feeling WOW, that they have done so much in life, and as a couple, they were role models to others, and am trying to show my gratitude to them, by remembering every single thing they have done! So having said that, hope I did not damper your spirits about new year resolutions! Please don't be, my intention was not to damper your spirits but to think about making the same resolutions every year, in case if you are doing so...! Or may be you might come up with a new idea or give me a idea as to how to stick to new year resolutions!? Any suggestions is always welcome! Okay, lets get to the eating mode! Its year end, and as I brought up the topic of resolutions....I will bring the topic of eating healthy...! Eating healthy should not be boring, bland or tiresome! There are many ways, you can make your family eat veggies and love them! I found a new way and thought of sharing with you. Hope you like it and try it and enjoy as much as my husband and kids just loved and asked me to do everyday!! You can always use, store bought or left over chapathis for this, or can make fresh chapathis. Soak Red chillies in hot water for about any hour, more the better. Grind it to a smooth paste, with ginger, garlic and can add little water to get the sauce consistency, add salt and pinch of sugar and mix well and keep aside. Boil potatoes and peel the skin and mash it, make sure potatoes are not over cooked and become soggy! In a deep pan, put 2 Tbsp of oil, and once its warm, add capsicum, fry for few mins and then add, paneer crumbs and potatoes, red chilli powder, jeera powder, coriander powder, salt to taste and mix well and keep aside. Warm the chapathi with butter and put it on a plate. Spread the red chilli sauce evenly, in the middle, add some lettuce, onions, carrots, and make cylindrical shape of the Potato curry and place it on top of the veggies, spread some Date and Tamarind chutney on top the curry, and fold the bottom first and fold both the sides carefully and serve it with a tomato hot and sweet chutney! Enjoy! Today, is a very special day, it's my birthday! Well, that's very childish and funny and silly, that I am calling my birthday as special and announcing it myself! But why I call it as special, because, I would love to share a recipe of my mom, today, which is totally traditional, authentic and many people would have forgotten it, and am sure would definitely remember their mom today, and call her or visit her and ask her to make it! Since it's my birthday, my Mom, always used to call me, send me messages, first thing in the morning, after I came to this country! Before that, it was a very special day for her, she used to be so excited, busy in making some 3-4 sweets (desserts), since I have a sweet tooth, gave me oil bath, and surprise me with gifts....! But this year.....no calls, no messages......it's only silence! Its more than a year she left me and 3 months ago my Dad left me....making me and my brother, all alone in this whole wide world! Well, we both are grown up, individuals, married, with kids, my brother holding a high position job....but still we are kids to our parents and we miss them and we love them! Today I want to express my gratitude, my love, my respects to my Mom, who was wonderful, amazing, caring, loving, giving, selfless and very very kind and forgiving! And many more amazing qualities she had which I don't find right words to express! This recipe is very traditional, and very healthy, since it has to be eaten before you start the main course. It helps in digestion and its very good for all stomach ailments. It's very simple to make, yet in this time and age, people would have forgotten the most yummy, healthy dish! So here goes the recipe, am sure you will call your Mom today, and ask her to make it or if you are far from her, you will make it and call her to say that, "somebody had posted this on blog, Amma, I remember how you used to make it when we were kids and today I tried and I just love it, as before"!! But "if" there are unlucky ones like me, who have lost their mothers, will definitely try this, as I did and cherish the old memories, down the lane....! Love you Amma! It's called as Tambuli! Its a yogurt based dish, which helps in digestion and stomach ailments. It's done with different variety of greens, or ginger. The most common type of Tambuli is made of Doddapatre, which is known as Big Thyme, well, I googled since I was not aware of what Doddapatre is called in english. It has a very very unique smell and taste, which is very good and helps in digestion. But Doddapatre or Big Thyme is not available here, or atleast I have not seen, so I tried with Ridge gourd peel, which is very good for IBS(Irritable bowel syndrome)! I forgot to take a picture of Tambuli, next time when I make it, will post the picture! You can add either Black pepper or Green chillies, if pepper is used, add it after you put cumin, else you can add Green chillies later. In a small pan, heat the ghee, and add cumin, after the aroma comes, add black pepper, add either ridge gourd peel,ginger or doddapatre and on a slow heat, fry until it slightly changes color and then add green chillies and coconut, and fry for 2 mins and transfer it to the mixer. Once it cools down, grind it with little water, to a smooth paste. Add yogurt and salt to the paste and mix well. Tambuli is ready to eat!! Its neither should be very runny consistency nor very thick as chutney. Before you start eating your meal, mix Tambuli with hot rice and enjoy and good health! It's been a while I posted a recipe. Today I got into mood of writing the blog. Exposure always makes you learn new things, enhance your knowledge and thinking. But I say, that, not all kinds of exposure will result in positive way! Certain kinds of exposure gives and leaves negative impacts on life! As I had to visit India 2-3 times a year since my parents were unwell, last couple of years, I have been observing that there is increase of hospitals in almost every street, which is not an exaggeration! Every street one "Multi speciality hospital" has popped up! Every street has pharmacy, which in India we call as 'Medical store', and all hospitals are specialized in almost every areas! Which I feel is the result of our people getting exposed to different cuisines, life styles, multi national companies(MNC), and high amount of stress! What Multi National Companies has to do with increase in hospitals, question would come up! Yes, right form the final year degree of college, students will be interviewed to different companies and immediately after graduation, would have a job, and salary in some 6 figures, per month! As kids live with parents in India, even while working, or even if they get a job out of their city, they do not have any responsibility nor parents would expect to send any money, all their salary would be "pocket money"! So here comes the exposure! They are young and have money!!!! So like to explore different life styles, eat out every day..which is the result of many illnesses which was not heard in India, now has become common and people are getting those illnesses at a young age! And even alternate medicine is getting its popularity and its high in demand and a tough competition to Alopathy! The claim that there is no side effects and garuntees 100% cure! For example few years back nobody heard or knew about Thyroid issue! There are two types, hypo and hyper! Thyroid is a gland which controls metabolism and if the gland is under active or over active causes sever issues! And the irony is within 5-6 years, I hear every other person having this issue and there is both allopathy and alternative medicine avlaible! I saw a small clinic, in one of the residential areas, which had a board saying, "specializes in Diabetes, Hypertesnion and Thyriod issues"!!!! There were days when Bangalore had only few big hospitals and very few clinics, where you could find General physicians! And those clinics would be busy only in winter or rainy seasons, as people would complain of cough/cold/fever! Other than that nothing major was seen! And illnesses was heard only in older people! But now even small kid is exposed and can get anything! Which is a scary situation! But people are aware of these and there are Gym and Yoga centers becoming popular too! But the funny part is, they are aware of these illness still they are attracted and lured to different things and still want to be healthy, so they go to Gym and Yoga! Hopefully people will draw a line and start to balance between life styles changes and health! So to start with, let's go back to our old traditions and food, which was always healthy and kept us happy! Today I would like to share the yummiest dessert, which is mostly or can say, it's only done in South India! It's called Sajjappa! It's a tradtional dessert done mostly in festivals. It's my mom's bestest recipe and it's my most favorite, she used to do the best Sajjappa! I could eat 4-5 of them at a time! And today my kids love them and asked me to learn! Though I haven't tried yet making, the above picture is from my mom's kitchen. Which I could not wait to share with you, especially today! Today, marks one year! My mom passed away, so I would love to share her's most yummiest, dessert with you all ,in fond memory of hers! She used to always make it for me! Hope you will try to make it and I bet you would love it! So here goes, the recipe! In a bowl mix, chiroti rava and 3-4 table spoons of oil, a pinch of salt adding water as requiredto a firm dough and keep it aside for 2-3 hours. Mix both dry and raw coconut (vana kobri and hasi kai thuri) equally, half cup each and grind it in the mixer. In a pan mix the grounded coconut and jaggery and keep stirring on a low heat, until it leaves the pan sides and mix well and become hoorna and you can add finely chopped cashews now. Now knead the dough well and roll it with the rolling pin into medium circles, of poori size. Keep a big spoon full of the hoorna and close it on all sides and again roll it into circles. Heat oil in a deep frying pan and make sure the oil is hot and deep fry into slightly golden brown. Now your yummiest Sajjappa is ready to eat! My mom used both coconuts and grinder first so that, the filling( hoorna) will be firm and not liquidy since its deep fried. Make sure the hoorna is not liquidy else, the it will open up, while frying and you cannot use the oil. This morning, I was browsing for some new recipes, and found my own blog, when I was searching! Its been a year now, since I blogged! Not that I did not want to blog or connect with my readers, but life went upside down this year and still not able to cope up with the things that happened! My blog says "Welcome to my place, Ammana Adige and Bengaluru Samachara"! Those who cannot understand the language, it means "Welcome to my place, mom's cooking and Bengaluru(city) news"! This blog mainly has my mom's recipes and this blog is dedicated to my mom, who taught me cooking and who was a amazing cook herself! I wrote "who was...."! Yes, she passed away 6 months ago, leaving me shattered, heart broken and sad! I just cannot believe myself that, I wrote she passed away! Did she really go? I could not come to terms with this question and I wonder each day, did she really go!? Six months, is a long time for me! I used to call her every single day, from past 6 years, it was part of my day and day would not have completed without talking to her. And 6 months, I haven't spoken to her, nor heard her voice and it's total blank, void, silence and loneliness, grief, sadness filled in! There is not a single moment in a day has passed without thinking of her....! I am eating/sleeping/talking/watching TV/doing all my chores and days are passing by and I really wonder and feel weird and strange that, I am doing all these without her! I wonder myself sometimes, how I am doing all these without her! She was not living with me, she was some 8,351 miles far away from me! But never felt that way, never felt she was far away! We used to talk every day and my Dad had gifted her Ipad for her birthday couple of years ago and she used to chat with me, send message to me everyday and that was the first thing in the morning I would read, her message! Everyday from past 6 months, I keep looking at the messages in the morning, to see, if she ever write to me! Really she is gone! Now also I call every day thinking that, she might pick up the phone....! She used to wait for my call everyday...and today my Dad waits for my call....! These little moments, matters so much in life, you won't realize until you loose them! I just feel scared and want to hold on to time, not to move forward, since I feel she is going far far away from me! Well, she has really gone away! Now every single day, I do keep remembering the olden days, the golden days of my childhood, where Amma was a multi talented, multi tasking, awesome, loving, caring mother, wife, sister, daughter, daughter-in-law, friend, cousin and many more.....! She had a very awesome voice and always used to sing and hum songs! She used to write short stories and poems, that was her passion! Writing and singing was her passion, but she never developed nor gave importance to her talent! She was a really an amazing cook, she used to learn and try out new recipes and inspire others to do so. She learnt baking(in those times it was a big thing to buy oven and do baking at home), used to do concentrated juices of all seasonal fruits, fill into some 20 juice bottles and share it with her sisters! She was a role model, mentor and mother to her sisters and brothers! The day she passed away, all her sisters and brothers, paid tribute by singing the Bhajans(Devotional songs), which my mom had taught them and that was everyday routine, that all 6 sisters and 4 brothers have to be in the family room, at 6 in the evening, to sing those bhajans with her, when they were young! There were always guests at home and she was an awesome host! I never remember her saying "I am tired today"! She used to wake up at 4.30 in the morning every day and her day used to end at 10.30 in the night! She was religious and followed all the customs and traditions and every festival...now I can say, was done like a wedding! I meant, with so much traditions, very colorful, dedication, grand and auspicious! That's the reason, now when I look back, I feel it was like a wedding! So much of preparations, she used to do, effortlessly, she had so much passion, dedication, in what ever she did! She was a strict mom, but never tried to control us! She always used to have open discussions and listen to us and very generous. I really really wonder, how and where so much of energy, passion, dedication she had in all the things....! That's incredible! She learnt Piano at the age of 75!! And she was on a advance level and the "Teacher", was amazed and used to give example of my mom to others when it comes to learning, discipline and dedication! Playing Piano became like a second nature to her! That smile on her face, the abundance of kindness and forgiving nature she had, I guess it's hard to find! The same Amma(mom)......from past one year, suffered with pain and gone through a lot, but still never gave up mentally, she was strong! Before she left to the hospital, two days before, she passed away, she folded her night dress and her towel, put it in the right place and said "Bye" to my Dad and everybody and left....! Every body from my Dad's side, my mom's side, came when she passed away and me and brother were over whelmed by hearing and seeing, the response of all, how much everybody loved, respected, cared my mom! That's how great, influential she was, well she is!!!! One of my cousins rightly said, when all the sisters and brothers were singing, to pay her tribute that, "Can you imagine, she meant, valued, influenced so much in all their lives that today they are all singing for her"!!!! So this post is a tribute to my Amma, who was and is everything to me, in every way. I bow her with respect, love, gratitude and affection! I miss Amma! The recipe I am sharing now, is Amma's and today I had made and thought of sharing with you all! I keep writing, sharing, connecting with you all dear blog readers and thanks for reading my post! Happy New Year filled with tons of happiness and good health to all of you! Soak Channa dal, in water for about an hour or two. Grind soaked channa dal, cumin, green chillies, coconut, turmeric to a fine paste. Cook, cut ash gourd pieces in water, until soft, add little salt and then add the grounded paste, and more salt to adjust to taste and water to desired consistency. Since its Channa dal, it becomes thick, so you can add water, to a desired consistency. 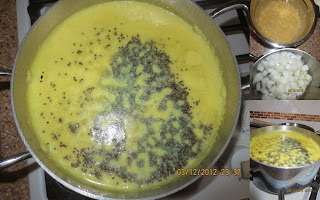 While its boiling, in a small pan, add oil and mustard seeds and when it crackles, add to the majjige hulli and turn it off. After turning off the heat, add yogurt and mix well. Serve with hot rice and happla and sandige(Papad) and enjoy!